What is an EPC page 3? This section lists the measures you could undertake to improve the energy efficiency of your home. The most important thing to note when looking at this section is that the improved ratings shown are cumulative, meaning that the new rating shown next to each new measure as you move down the list is based on all the previous measures having also been installed. Recommended measures: This lists the measures that you could implement to improve your EPC rating. Indicative cost: This is an estimate of what the upfront cost of installing each measure would be. Typical saving per year: This is an estimate of the amount of money each measure would save you on your energy bill each year. Rating after improvement: This column shows what the improved EPC rating the property would be after the implementation of each measure. Please note that these ratings are cumulative, each improved rating being based on all the previously listed measures having been implemented. 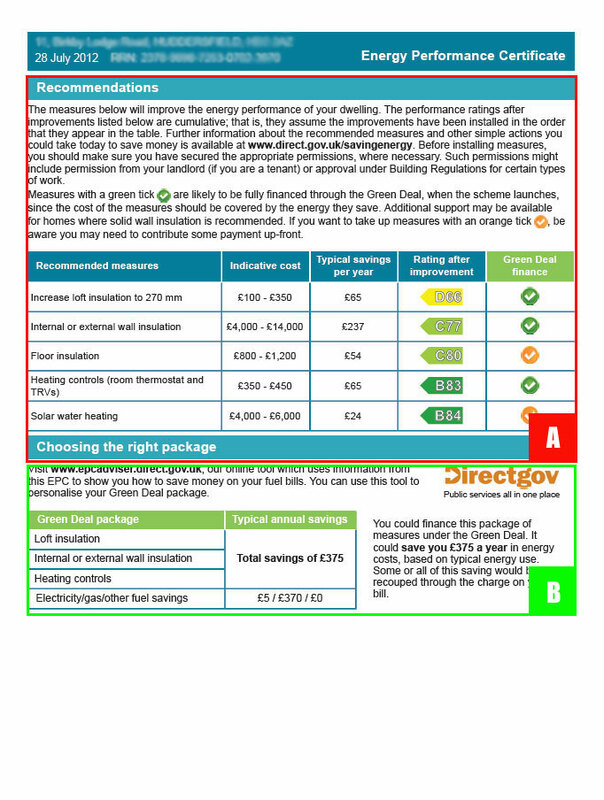 Green Deal finance: In this section a green tick indicates that measure is eligible for full funding under the 'Green Deal' and an orange tick that the measure is eligible for partial funding with either an alternative funding mechanism or the householder contributing to a proportion of the upfront cost. This section provides an overview of the money you could save on your energy bills if you were to take up the Green Deal Scheme. We would be happy to provide you with any further information you require about how the Green Deal works and what it can do for you. Visit our website www.easyepc.org or call us on 0845 4098439.